Generating a *quantitative* global temperature record for the Phanerozoic will be difficult, especially for the pre-Cretaceous. Veizer is the only one bold enough to try so far, I think. His shallow-ocean compilation (mostly from the tropics) contains a +8 per mil drift over the Phanerozoic. He normalizes this with linear regression, and assumes the residuals reflect a true temperature signal. But whatever controls the long-term drift (diagenesis, ocean-water d18O, whatever) can also explain–at least in part–the residuals, yes? And then there’s the whole business of scaling tropical SST to global surface temperature. The goal of our pH correction in 2004 was not to produce a quantitative temperature record. Our goal was to show that the correction produces a record that is more in line with the robust but qualitative temperature record from glacial evidence. We never intended our record to be used as a quantitative record of temperature. Qualitative maybe (there is a temperature signal in there somewhere), quantitative no. It will be challenging not only present the data, but also to calibrate the different data sets. The reason is that there don´t exist a common definition of “global average temperature”. Therefore, it will be very hard to calibrate the values of global average temperature between the different data sets. The term “anomaly» does not help either, because there do not exist a definition of “normal global average temperature”. This is obvious because the “normal global average temperature” cannot be defined if the “global average temperature” isn´t defined. This is not a significant issue if we only regard the trend of “average temperature” in one single data set. However it will be a significant issue when trying to use different datasets to produce a common historical record. How can a historical record of a measurand be produced if the measurand hasn’t been properly defined? My point is that to calibrate the different data sets, a common definition of the “global average temperature” is required. Further, the actually used measurand in all data sets will have to be transposed to an estimate of this new definition of “global average temperature”. 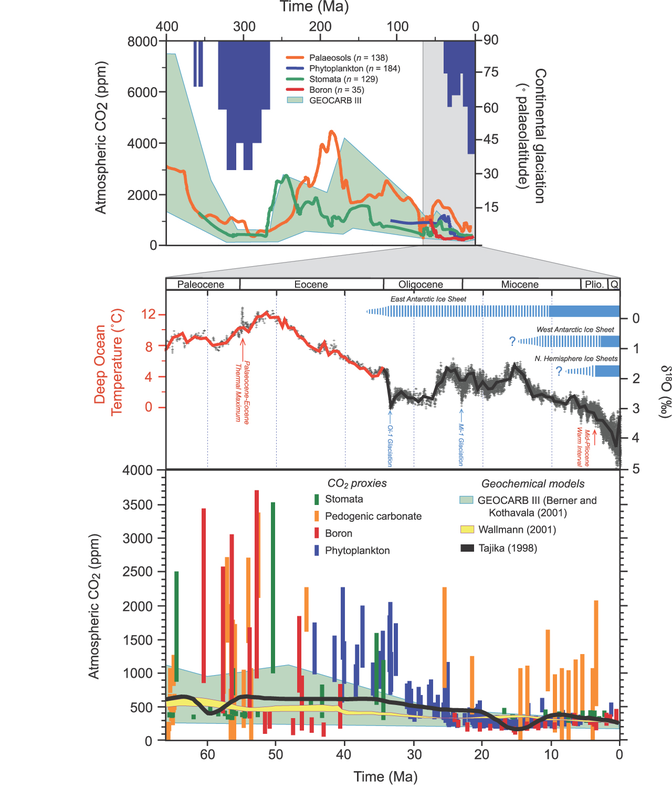 A group of us palaeoclimatologists (Gavin Foster, Dana Royer and Dan Lunt) have put together a plot using Dana’s compilation of CO2 over the last 450 million years, including the historic period and some RCP scenarios for the next 200 years. The plot and some text about it can be found here (http://descentintotheicehouse.org.uk/past-and-future-co2/). We have also calculated climate forcing from CO2 and changing solar output which puts the business as usual scenarios in some geological context. We all think coming up with a global temperature record to compare to this type of CO2 dataset would be great. We would like to add a few words of caution though – reconstructing global temperature is not easy (e.g. see Lunt et al., 2012) which is why such a record for the Phanerozoic doesn’t really exist in the peer reviewed literature. The paleoclimate community is moving in this direction but its slow progress involving lots of people and loads of data. As others have noted here simple scaling from a benthic or planktic d18O record is likely to be very inaccurate as the influence of ice on d18O of seawater (d18Osw) changes through time, the overall d18Osw changes on long timescales through geological process, diagenesis modifies carbonate d18O and importantly the relationship between deep (or surface) water temperature and global temperature is not a fixed constant (e.g. think how latitudinal SST gradients change through time). That being said, provided these caveats are noted, it is possible to use d18O-based approach to provide a good schematic global climate history but we caution it’s not likely to be an accurate record of global temperature. Reconstructions: New York, Oxford University Press, p. 3–17). Combining this with the d18O-based schematic would be quite a nice illustration of changing climate state through time. This is not a graph of climate data, but it is a really simple real world example of how short term trends can be misleading (called by some the ‘escalator effect’). Unfortunately bad graphs are like naked pictures. Once they are out there, they will never go away. We have less than 13 years. That’s bumper sticker size. And that could be nationwide in a month for under $1-Million bucks. Is the most telling I have seen. Hansen and several others , and the Ipcc, have been elaborating the forcing argument for several years and the faint sun paradox has been discussed also, but to see the net result in a graph with the RCP pathways added, shows just how radical the future forcing could be. May I suggest it would need work to become not just a graph for scientists but one for general consumption/understanding. Yes, it is not a temperature graph, but very relevant to all the discussion in this thread. Attempting to fit several records in similar style to the wikipedia image, that is multilinear scale, but expanding it out so almost every datapoint is visibly present… currently the image is about 26000*700px. Marcott et al has separated series for NH, tropics and SH. Next record to incorporate in this megalomaniac image, would be a similar, more detailed record, of the more recent times, bronze age, iron age or after ancient history (535 and all that). are there some publicly available? tried to fit the wikipedia-image (http://commons.wikimedia.org/wiki/File:2000_Year_Temperature_Comparison.png) in the same chain of images (currently at 27000 pixels wide), I believe these reconstructions are pretty accurate. This leads to problems in the intermediate sets of data, which have to be adjusted a bit downwards (~0,2 -~0,6 C) to get smoother transitions between data sets all the way back to 64Mya. Of course the datasets from far back are obtained from different areas thus they are not uniform in their represatation of global temperatures. F.e. Using NGRIP to pose as global temperature is a bit false since the tropics didn’t cool as much. It appears that I’ve missed inserting EPICA between the NGRIP and Raymo series, this might lessen the adjustments a bit (expanding the width of the image to 30000 pixels :-D), still to be added is the instrumental series, probably it would be best to use biannual to monthly values so the final width of the image would probably be ~33000 pixels (some labels needed). There’s probably no paper in the world that would print such a disproportionate image (aspect ratio ~50:1). This 10 year old Wikipedia graphic does more harm than good. @111 Go back and read the Summary page for the graph. Read it all. See the cautions, methods, sources, links. This work is helpful, informative and exemplary for its transparency. A nice statement of probability, that. Prescient. Also: the page in question says this figure is part of a series of plots created to illustrate changes in Earth’s temperature and climate across many different time scales. Nine are linked. The 500 Myr time-scale work in this series figures in this post as an example of one of the ‘better’ graphs. I’m very pleased to hear you’re working on it. As an outsider looking in, I observe: a) the achievements of the last 30 years in quantifying palaeoclimate are simply stunning; and b) there’s miles to go yet to build a coherent picture. 1. LGM temperature. Hansen 2013 briefly touches on this. Global estimates seem to range from about -3 to -6°C … or is that -12°C (see NGRIP in Shakun 2012). “Minus 12” as a global average got a run in a popular BBC television production last night (Ice Age Giants). What’s a mere pleb to think? Seriously guys, this thing is just a few years back. It’s plain embarrassing. And very important to AGW context. 2. Eemian peak. This one is not so bad, but we do seem to keep changing our minds every year or so. Higher and higher appears to be the game. 3. Oligocene reglaciation. I was short with PaulW above, but his point is valid enough. The Hansen interpretation of Zachos looks too warm. 4. Cretaceous temperatures. Dana Royer says that his were only meant to be qualitative (and definitely not global); fair enough. I understand the problems with calcareous δ18O (long term baseline changes; sample “changes in storage” over a hundred million years). It needs an answer though. If we keep burning fossil fuels, global warming this century is likely to be as large as the increase since the peak of the last ice age, 20,000 years ago. Back then, New York was under a mile and a half of ice. That is basically sound I think, with just a touch of (warranted!) exaggeration. Importantly, it supplies context for those who won’t grasp the importance of a small numerical increase. But it fails when the likes of Dr Alice Roberts* (and practicing geologists I know) claim the LGM was -12°C. “These reconstructions indicate:- (A) Global mean surface temperatures over the last 25 years have been higher than any comparable period since AD 1600, and probably since AD 900. (B) There was a Little Ice Age centered around AD 1700. (C ) There was a Medieval Warm Period centered around AD 1000, though the exact timing and magnitude are uncertain and may have shown regional variation” I see such poorly qualified statements as useful solely for MWPEs & LIARs & those of similar ilk. Yet this statement is referenced (not unreasonably) to the NRC (2006). Perhaps the Wiki page needs updating. Didn’t the UN IPCC recently publish something on this subject? The graph is the work of a Robert A Rohde and contains some very odd plotting. The 2004 plot is probably global HadCRUT3 while the proxies are NH, so not a good start. The black trace is probably the global HadCRUT3 10-year running average. Given the accuracy of HadCRUT3 (compared with the proxy accuracies), I see no rationale for not extending the black plot up to 2004. Perhaps Robert A Rohde thinks global temperatures are about to crash back down a couple of tenths of a degree. (Of course NH temperatures have dropped a bit in recent years but not by that amount.) Also strange (if it is global HadCRUT3) is the high position for the 1940-1970 inflection which is way too high, perhaps a move to diminish the comparative size of the recent warming. Within the rest of the plots, there is also some strange graphing at work. (See here for the Wiki graph’s legend.) The red curve that gives most visual impact is Moberg et al (2003) but far too droopy at its early end. Both this plot & Mann & Jones (2003) (the light green plot) appear in AR4 figure 6.10. Note on the AR4 graph the two plots are crisscrossing each other at AD600. Yet Robert A manages to separate them by some distance. The other plot (yellow) stretching back to AD200 is the NH reconstruction of Mann & Jones (2004). Robert A has manages to achieve some serious errors to engulf his plotting of that trace. All in all, I can but assume that Robert A is doing his best to produce a graph with an eccentuated MWP & LIA while providing as few hockey-stick type characteristics as possible. Bad Robert A!! Thanks Glen Fergus for the note on Oligocene. NGRIP is a nice and notably detailed record but all too jagged in my opinion looking at global tempereatures, one has to take the Antarctic record in consideration too and smooth the record to get it closer to global values i think. By how much, I have no clear idea yet. The Oligocene initiation has likely the same problem but in opposite direction, the Antarctica likely had a sudden (in geological terms) drop in _surface_ temperatures on the onset, even though the ocean temperature records show it to be more gradual (I believe, so it looks on Hansen 2013). Antarctica and surrounding areas are c. 4% of the planet surface and a drop of 10 degrees average there should show in the record. The same could happen on some northern areas when Pleistocene glaciations began, or a bit earlier. Fully agree that “a) the achievements of the last 30 years in quantifying palaeoclimate are simply stunning”. The Raymo (can’t spell the ‘Lisckeiesci’) series is, I understand, almost solely of the ocean sediments or corals so it could be adjusted to be a bit jaggier, to represent the polar variation more, maybe? So, the image linked in #83 should be reworked on times after Antarctic glaciers began to form. I should’ve guessed. That’s a touch harsh, MA. You impute malice to what was probably just a bit of graduate student ill-judgement, a long time ago. Whilst Rohde has published with Ms Curry, I sincerely doubt that he shares her opinions. The opposite, more likely. For a while the articles were illustrated with IPCC figures, but these were deleted as not being available under a free license, and a plea to the IPCC for permission to use the graph was turned down. So if anyone can produce updated graphs, please publish them with a suitable license (such as Creative Commons Attribution-Share Alike 3.0 which retains copyright and requires attribution, but allows commercial use) so that editors such as myself can upload the files, or better still register at https://commons.wikimedia.org/wiki/Commons:Welcome and upload them yourself. A basic outline of how the graphs were made would be needed. 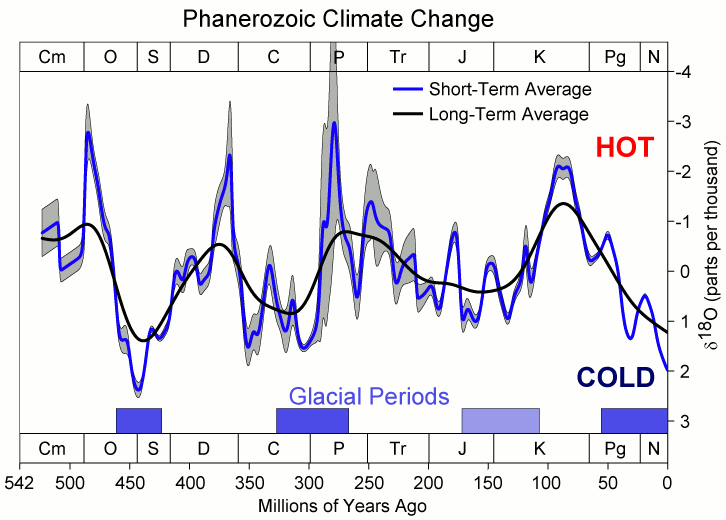 Examples of useful files are the 2,000 year graph at the RealClimate: Paleoclimate: The End of the Holocene article, and the 1,000 year graph at http://thinkprogress.org/climate/2013/07/08/2261531/most-comprehensive-paleoclimate-reconstruction-confirms-hockey-stick/ which were both made by Klaus Bitterman. It would be a terrific help to science communication on Wikipedia to have up-to-date graphs available to illustrate articles. I have been long time lurker on this blog and fascinated with the great work that people do here. I also happen to be a Microsoft employee. Some quick thoughts from a climate science common person that is really perplexed why the average U.S. citizen hasn’t grasped the urgency of demanding action from our elected public officials. While I am not a climate scientist, or a scientist at all, my understanding is that climate change has, is and will increase the frequency of floods/droughts, intensity/frequency of extreme weather events and intensity/frequency of fires. Thus, if we could get people to visualize some of this where they live it may help with the emotional connection they need to demand action. To me this is one great big business intelligence problem and Microsoft has some incredible technology that may be able to help. Give this URL a watch (about 20 minutes long) and come back…. Think about the prison scenario in terms of extreme weather frequency – over time. If people think this is a good idea, I could make a run pulling a small sample data to illustrate the point. First, of course, keep all graphs simple. In line with that, do not show more than two lines on any one graph. Three or more lines gets VERY confusing VERY quickly! Second, use graphic lines (solid, dotted, dashed, little squares, little triangles, etc.). Keep in mind that many people have defective color perception, and your color coded graph will NOT be looked at by most of them, simply because they can not differentiate between the colored lines you used, and the graph is absolutely useless and meaningless to them! About 1 in 10 males have one of the common forms of red-green colour vision deficiency. I don’t, but I have colleagues who do. My policy has been to try to avoid using red, green, orange and orange-brown traces of similar width and style on the same graph panel. Do you have trouble reading the new Wikipedia graph above? I’d be interested to know. Can you detect the red line within the orange in the first panel (they’re Dana Royer’s colours!)? Those sort of responses won’t help people with other, rarer colour vision problems, but the extent to which one should degrade general appreciation of a graphic to cater for a tiny minority is a difficult question.